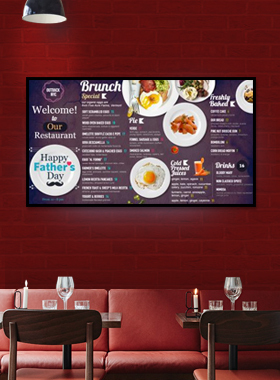 Father's Day Celebration with Digital Menu boards in a Restaurant. Father's Day, which is celebrated worldwide on the 3rd Sunday of June, presents another one of the festive extravaganza after Mother's Day and Valentine's Day. Statistics declared by the National Restaurant Association in the US suggest that 25 % of the 68 million dads (approximately 20 million) get involved with the celebratory proceedings, mostly with their families. Further, the numbers reveal that 67% choose to dine for an evening meal: 24% for lunch: 11% for breakfast, and 10% for a family brunch. This year the total spending on Father's Day would cross $15.3 million (a record in itself), with an average spends of $115, says the National Retail Federation. Father's Day is always celebrated on a Sunday, a holiday, and hence you can anticipate a reasonably larger numbers of customers than a regular weekday. Expectedly, this would translate into larger volumes, more sales, and a lot more activity on your part. The fathers - dads - in almost all cases would bring their families with them for breakfast, brunch, lunch or dine. Here as well, you can expect larger numbers entering your stores which will motivate you to serve-up special or exclusive menus. The father - or a dad - perceived as the financial head of a family, is expected to have a larger budget for spends on this day which you, as the restaurateur, should capitalize on. Given comparatively higher spends by the Man of the family on this day, one would recommend mark-up pricing of some of your premium up-sell items. Particularly if you are planning to offer free gifts either in-house or with business tie-ups. On this, good opportunity for business tie-ups and brand promotion activity of some of your prominent suppliers. All customers are game for any freebie on offer in a restaurant - including dads! Given an anticipated higher spends on this day, you may entice customers with your specials in appetizers, entrees and meals with a glass of Champagne, or a couple of pegs of whisky or even a bottle of beer offered as a freebie. Ice creams and desserts too are a tempting incentive. Gift items such as an elegant T-shirt, Golf Tees, a Trouser belt or a fancy scarf can also be gifted if for instance the customer consumes menu items worth more than $60 or whichever threshold price you choose to consider. As we know, live music along with a delectable food menu is a run-away success in any setting. You too can team-up with a local music band in your town. A perfect fit for Father's Day when dads along with their families would look forward to good food & entertainment - and be most happy to pay for it! A dance floor in-house along with an eclectic buffet spread would certainly make everyone's day. Run A Contest For Dads. Build Up Excitement. Build Your Brand. As people on this day expect to be entertained, you as a restaurateur can run a contest say - on the best jokes on dads by their kids - and post the same on social media sites prior to Father's Day. The most liked and shared jokes will receive a $50 gift voucher which can be redeemed only at your restaurant. A great way for branding, as well as obtain new customers. And these customers, once inside your restaurant, will be willing to spend more than $50 on your delicious menu with their families. Make A Day Adventurous For Dads With Some Business For Yourself! Particularly relevant for existing customers whose profile and contact details you already have. Present them with a package: A good massage at the nearby Spa, a movie in the afternoon, and a complimentary cocktail drink - all of the three offered free if the customer, the dad, visits your restaurant with his family in the evening for dinner. For this, teaming - up with the local Spa and a movie theatre would help. Also, a great way for customer engagement. You should be blessed with this opportunity. Innovate your menu. Add new items. Spruce up the existing ones. Make a 35 oz steak and display it proudly. Give a Grill Demo outdoors of some of your meat dishes. Then invite them inside for a gourmet's treat the dads and their families would remember for a long time. Include a Father's Day Special / Exclusive menu for brunch, lunch and dinner. Offer complimentary gifts in the form of alcohol, dessert, or even a gift voucher. Design your menu suitably and display prominent items appropriately on the digital menu board. Devise catchy captions to entice the dads and their families. Run a fun event, live, by asking the dads children (even grown-ups) to pen a line on their father - and display the message on the digital signage screen. Use digital signage as a great motivating and entertaining tool.